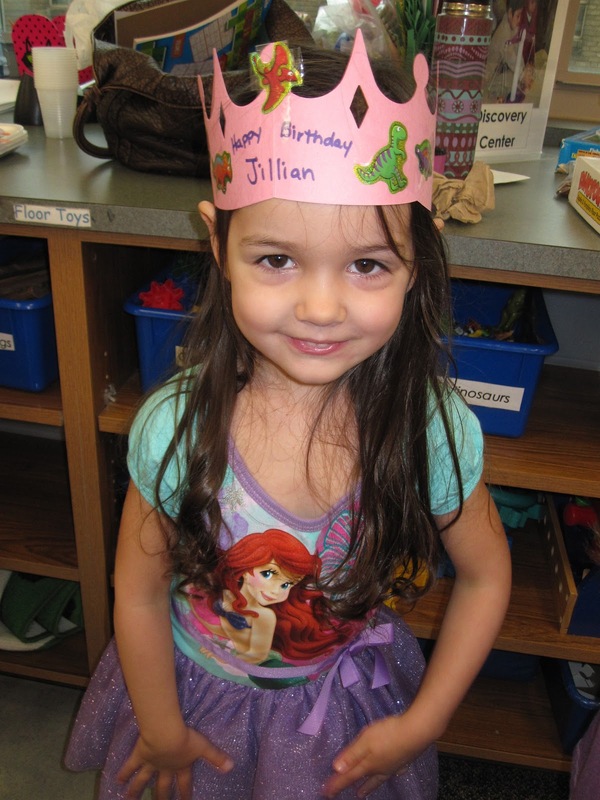 Watching my almost four year old celebrate her birthday at school today. She was so excited...and so very proud. It is dinosaur week, but she will dress up as a dinosaur on Thursday because today she wanted to wear her special princess birthday dress. It is great for twirling, you know. This morning before I walked out the door Myles said, "Mom, you look like Indiana Jones!" I looked down at my earth tone floral dress, 3/4 length tan belted jacket, and five inch patent camel peep toes shoes and thought...oh great. He went on to explain that it was a good thing because Indiana Jones is so cool. "But Myles, I'm not a boy!" He replied, "Oh Mom! I meant like a girl version of Indiana Jones!" This weekend tee-ball games start. We are quite excited to watch the AAA Reds take the field. I think it will be so fun to see both Myles and Jillian playing together (with Daddy on the field as a coach as well). A memory for sure. I'm sure it will be the only year they play together...so I'll need to record it in the memory books. I actually thought about the rain today and chose not to do my hair. Brilliant. Rain on curly hair = no big deal. Rain on straightened hair = big frizzy mess. Tomorrow...vacation day. I get to spend all day with my favorite little girl. I can't wait. We are going to do everything and anything she wants to do! 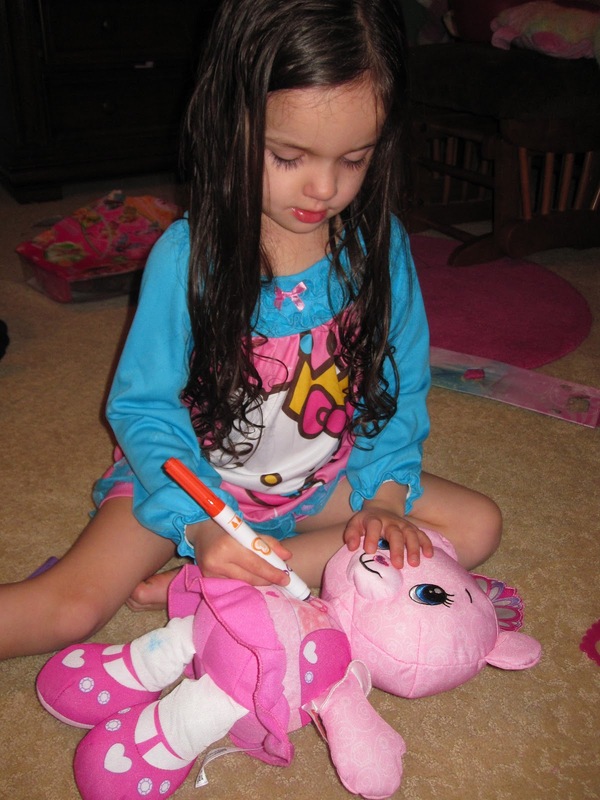 Jillian opened her presents tonight. We always do it on their birthday morning, but Ben has an early morning meeting, so tonight was the best option. After playing with her new things for a little while, she went to bed with her new prized possessions. I had to remind her a few times to lay down and close her eyes. "I know, Mom. I really want to...but it is just so hard not to play with my new toys!" Love her. Who knew that a Doodle Bear could bring so much joy (well, Ben and I did...that's why we got it, actually :). This weekend we are starting construction on a new deck! It was fun helping to design it and I can't wait to see our new outdoor living space come to life! The icky cough that everyone seems to have right now. My poor kiddos both have it. Can't wait for warmer weather and more outside time! I am registered for a race next weekend. Typically this is not something that I would EVER put on this list. The reason it is on this list tonight? I have not run since before spring break. Oops. Oh - and be sure to stop back by tomorrow to see Jillian's amazing birthday video. I can't wait to share it with you. Even better? There might just be a giveaway for a custom video of your own!! Love reading your post and you!!! Happy Birthday to your little girl! LOL on the Indiana Jones comment...isn't it amazing what kids notice? Enjoy! Your lists are always so cute! Good luck in the race.